While heading for Morocco, Tahir Shah and his family did not know they would live with an 'army of invisible spirits', the Jinns. Dar Khalifa, the Caliph's House, had been empty for almost a decade. In Morocco, everyone is quite well aware that an empty house is a magnet for the wicked. Inspired by the Moroccan holidays of his childhood, Tahir Shah dreamed of making a home in that marvellous country. At the age of thirty six, he bought Dar Khalifa, a crumbling ruin of a mansion by the sea in Casablanca that once belonged to the city's caliph, or spiritual leader. He then travelled to Casablanca with his wife Rachana and his children to live in the house. The property they bought was exceptional: a maze of interconnected rooms and secluded courtyards, mature walled gardens, an orange grove and a swimming pool. There were only two problems with it: first, the remarkable state of ruin — walls discoloured with algae, birds nesting in lamps, flooded bedrooms; second, the fact that it was haunted by jinn. Many Muslims believe that when God created mankind from clay, He fashioned jinn — or genies — from fire. The existence of these evil spooks is accepted by everyone in Morocco, except by Shah. Unfortunately for him, there seemed to be dozens of them in the building. And they all wanted him and his family out. Shah finds it insane to go to the hotel while he had his own house. So he decided to stay. But the house guardians warned him not to sing, laugh, or speak in anything but a whisper so as not to anger the Jinns. “The guardians recapped the list of warnings: “No laughing, talking, walking around, or thinking impure thoughts, and especially going near the toilet at night,” writes Shah in the Caliph's House. Shah left the lights and noise of London to find himself in an old house in Morocco with no electricity and full of evil spirits. The Caliph's House is a story of home-ownership abroad, of wrecking-crew builders, haunted nights, hidden rooms, stolen title deeds and a plague of bees. The Caliph's House charts a year in the life of one family who take a tremendous gamble. The book romps between western scepticism and Casablancan superstition. Shah assails mystic tradition on one hand, and then, on the other, pricks a finger and drops his blood into a lavatory to please the Jinns. He buys a tortoise with a divine spirit. He learns to guard against house fires by hanging a salted frog outside the front door. The conclusion is clamorous and hilarious; he employs 24 exorcists, marshalled by a pot-smoking pimp in a gold lamé turban and accompanied by a huge goat with good karma, to rid his house of evil. 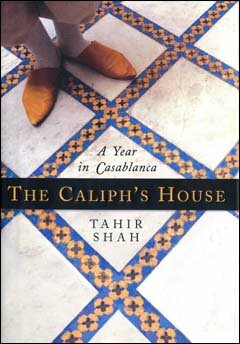 Then, over the course of a year, the Caliph's house changes the way in which Shah perceives the world. The Jinns, however, were only the start of his troubles. In the next few months he was assailed by an incompetent architect and builders, his assistant cleaned out his bank account and vanished, and the police took to raiding the house and had to be fought off by his army of builders. Gradually, he won the battle for control of the house, solved the mysteries of his grandfather's last years and exorcised the Jinns. Arriving at Dar Khalifa he was met by the house's guardians, Hamza, Osman and Bear. "I asked urgently whether they had heard about the suicide bombers. Hamza shook his head. There were other, more pressing problems, he said. The three guardians nodded in unison. 'Yes, the house, it's full of them.'" [.....] The first night we spent at the Caliph's House was a rite of passage. The guardians had pleaded with us not to stay there until the wayward Jinns had been dispatched. I protested vehemently. It seemed insane to move into a hotel when we had our own home. After much wrangling, Hamza, Osman, and the Bear saw that I would not be swayed. They ceded, so long as we followed a few guidelines. These included all of us sleeping in the same room on a single grimy mattress, around which a circle had been etched with a lump of coal. We were instructed not to open the windows, despite the suffocating press of summer heat. Nor were we permitted to sing, laugh, or speak in anything but a whisper. I asked why.